Solutions of time-independent Schrödinger equations provide many interesting predictions concerning quantum mechanical phenomena. The following discussion is meant to provide insight into solving such equations for potential energy wells of the infinite and finite form. The steps taken for finding eigenfunctions, eigenvalues, and wave functions will be examined mathematically. Their predictions will allow for interpretation of the physical significance of these quantities. In this section, we will focus on two types of potential wells: the infinite square well potential and the finite square well potential. The infinite potential well will be examined first in detail, and will be used as a basis for solving the finite potential square well. In each case, the importance of boundary conditions will be examined. Each problem is restricted to one dimension. By imposing this restriction, the math is simplified, while still allowing demonstration of interesting quantum aspects. A brief overview of of other types of 1-D potentials are also presented. 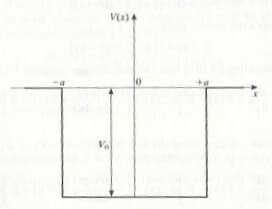 The particle-in-a-box problem is the simplest example of a confined particle. Examination of this problem enables us to understand the origin of many features of such systems, such as the appearance of discrete energy levels and the important concept of boundary conditions . By using the time-independent Schrodinger Equation (TISE), we are able to find the probability distribution describing the whereabouts of the particle in question, and are also able to obtain information about the permitted energies which the system can have . Write the time-independent Schrodinger equation for the desired system, including in it the correct potential functions. Normalize the wave function to ensure the probability interpretation is valid. Here, we have boundary conditions requiring that $\psi (x)$ vanish at $x=0$ and $x=L$, so that stable standing waves can form . The particle is free to move within the well, but has no possibility of moving into the region outside of the well. Therefore, we need only consider the solution of the Schrodinger equation within the space interval where the potential is zero. The TISE can be applied to the particle in a box problem to find expectation values for particle positions, velocities, and energy levels . For an explanation of how this equation was derived, see http://electrons.wikidot.com/schrodinger-equation. These allowed energy values, which depend on the quantum number, n, are called eigenvalues. This dependence shows that the higher the quantum number, the higher the energy will be, and the higher the number of nodes will be (points where the wavefunction crosses through zero). They help to describe the particular probability amplitudes, or wavefunctions, $\psi_n (x)$, which are allowed . 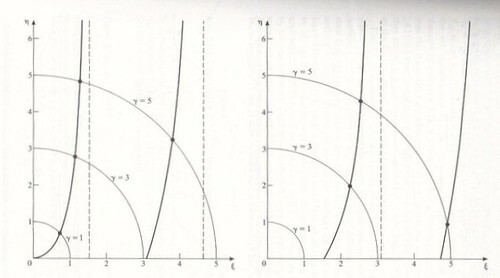 A graphical representation of these concepts is seen in Figure 1.2. Figure 1.2 The wavefunctions and probability density functions for several states. The energy comes out quantized, which is a natural outcome of the boundary conditions. The concept of zero-point energy, which states that the energy of the system would approach $E_1 (x)$ if it were cooled to absolute zero. This implies that the particle would still be able to move throughout the box (a contradiction classically) . The finite potential well is an extension of the infinite potential well from the previous section. The main difference between these two systems is that now the particle has a non-zero probability of finding itself outside the well, although its kinetic energy is less than that required, according to classical mechanics, for scaling the potential barrier . This type of problem is more realistic, but more difficult to solve due to the yielding of transcendental equations. The particle is again confined to a box, but one which has finite, not infinite, potential walls. We consider a potential well of height $V_0$. Figure 2.1 Square well with finite potential. Here, a=L. In this example, the origin of the x-axis was chosen at the center of the well. By doing so, the potential is symmetric about $x=0$, giving rise to parity (Note: this could also be applied to a symmetric infinite wells). For the finite well, two cases must be distinguished, corresponding to positive or negative values of the energy E . It is possible for the particle to be bound, or unbound. The case $E<0$ corresponds to a particle which is confined (and whose energy is less than the well depth) and hence is in a bound state . When $E>0$, the particle is unconfined and corresponds to a scattering problem. The latter case will only briefly be discussed. Figure 2.2  provides a prelude to what the wavefunctions and probability distributions for several states will look like in a finite well. Comparing Figure 2.2 with Figure 1.2 for the infinite case, we see that in the finite case, the wavefunctions do not have to be zero at the walls of the well. 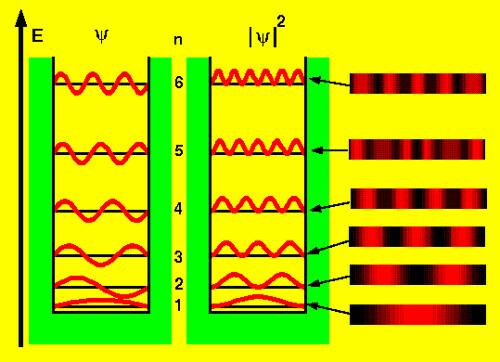 In the finite case, the wavelengths are slightly longer, implying that the allowed energies will be somewhat smaller. Figure 2.2 In this figure, the points O and L represent the walls of the well. Graph 2.1.1 The left graph shows energy levels for even states, while the right graph represents odd states. What can be concluded from this figure? The bound state spectrum consists of alternating even and odd states, with the ground state always being even. The finite well problem shows that wavefunctions are not localized in the vicinity of the well . 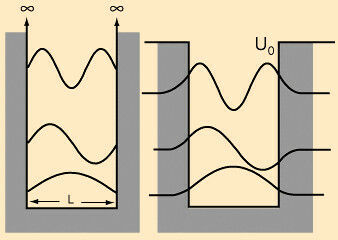 This is the case of unbound states, where eigenvalues of energy are a continuum. In this problem, a particle is incident upon the well from the left, interacts with the well, and gets transmitted or reflected. The solution of the Schrodinger equation is outlined briefly. Note that in one dimension, there is a lack of symmetry between the external regions to the left and right of the potential, since the particle is assumed to be incident on the potential in a given direction . Therefore, there is no need to exercise parity. 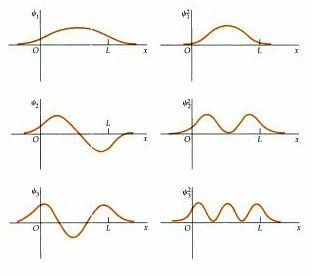 In the region of $x<-L$, the wavefunction is seen to consist of an incident wave of amplitude A and a reflected wave of amplitude B. In the region of $x>L$, the wavefunction is seen as a pure transmitted wave of amplitude C .
By applying continuity at $x=L$ and $x=-L$, F and G are eliminated and the ratios of $B/A$ and $C/A$ can be solved to obtain the reflection coefficient, $R=|B/A|^2$, and the transmission coefficient, $T=|C/A|^2$. An important aspect to briefly point out is that the transmission coefficient is generally less than unity, which is in contradiction to the classical prediction that suggests that the particle should always be transmitted . Figure 2.2.1 Comparison of infinite and finite well. The infinite and finite square wells represented here are amongst the most fundamental of 1-D potentials. Table 3.1 summarizes popular systems that are often studied, and provides a physical example of each, as well as significant features pertaining to each system. Potential well problems serve as simple, yet instructive models for quantum phenomena. Tunneling, or the penetration of barriers, as portrayed in wells of finite potential, is one of the most interesting aspects of quantum mechanics. It is seen in real-world applications, such as field emission, scanning tunneling microscopy, alpha particle decay of nuclei, and nuclear fusion reactions . 1. Bransden, B.H. ; Joachain, C.J. Introduction to Quantum Mechanics. London: Longman Scientific and Technical, pp. 158-164, 1995. 2. Eisberg, R.; Resnick, R. Quantum Physics of Atoms, Molecules, Solids, Nuclei, and Particles. New York: John Wiley & Sons, Inc., pp. 232-244, 1974. 3. Green, N.J.B. Quantum Mechanics 1: Foundations. Oxford: Oxford Science Publications, p. 40, 1997. 4. Lindsay, P.A. 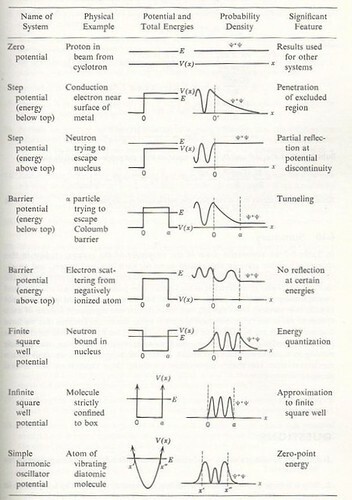 Introduction to Quantum Mechanics for Electrical Engineers. Berkshire: McGraw-Hill Publishing, pp. 51-59, 1967. 5. Pohl, H.A. Quantum Mechanics for Science and Engineering. New Jersey: Prentice-Hall, Inc., pp. 38-41, 1967. 6. Robinett, R.W. Quantum Mechanics. New York: Oxford University Press, Inc., pp.178-184, 1997. 7. Tipler, P.A.Elementary Modern Physics. New York: MacMillan, pp. 96-98, 1992.